While it’s estimated many conservatories are left unused in the colder months of the year, the advances in insulation, glass and heating techniques mean more and more householders are able to benefit from their conservatory year round. There are various options for heating and insulation, and it’s obviously easier to integrate these when planning a new conservatory, although some can be added retrospectively if you’re looking to improve your present structure. A combination of permanent and portable heating methods could be considered. Attached to central heating – it’s possible to extend your central heating into your conservatory, but you have to adhere to building regulations. Conservatories by and large are exempt from most building regulations but, primarily due to concerns over excessive CO2 emissions due to heating a large glass space, at the very least you’d be required to install a radiator with its own thermostat that can be turned off independently of the rest of the heating system. It’s important to check carefully with your conservatory supplier and local authority if you’re thinking of using your existing heating system. Electric underfloor heating – easier to install when building a whole new conservatory, but can be done retrospectively. Depending on how often you actually wish to use the conservatory, heating the space this way isn’t cheap but it’s comfortable and convenient, and there are no heaters taking up space. You’d need to consider what floor you’re using – carpeting would act as an insulator and stop the heat rising so wouldn’t be suitable, and ‘pure’ wood floors may not be the best option either although wood laminates should be fine. If you have tile, underfloor heating is the best choice to avoid the floor being very cold underfoot. Wood burner – can add a ‘feel good’ dimension to your conservatory, but will require proper installation and can compromise space. Take a look at the modern and stylish wood burner from the Wintergarden brochure, which is pictured above. Wood burners can look great in both a contemporary and classic setting. Electric panel heaters – relatively inexpensive to install although wall space may be at a premium if your conservatory is – or will be – primarily glass from floor to ceiling. Running costs can be high. The benefit of these is that they provide a localised heat, so you can stay warm without heating the entire room. Electric heaters – relatively cheap to buy and light so can be easily moved around and removed or added to the space as necessary. Convector or fan heaters are the two most common types but can be expensive to run, but cabling and their light weight can make them a risk if young children and pets inhabit the space. Oil filled radiators – a variation on the electric heating option above, they tend to be heavy so not as easily portable as electric heaters and will be costly to run as a long term heating option. Having provided a heat source for your conservatory, good insulation is paramount to retain it for as long as possible. Flooring – replacement is a drastic measure if improving insulation to an existing conservatory. Wood is a good insulation material as is carpet but neither are suitable if using underfloor heating as discussed above. Roof – specifying a tiled roof as opposed to a glazed type can help as most heat is lost through roofs, but you’ll need to check with a qualified professional if changing the roof of an existing conservatory due to likely weight differences. Glass – most heat is lost through glass, in fact around 15 times more through single paned glass than through a cavity wall, so this is a key insulation area to consider. Glass technology has improved over the years, so it’s worth considering the type you have in your conservatory. Conservatory experts Solarlux manufacture glass that more than meets current Building Regulations stipulations for glass insulation properties. The insulation properties of materials such as brick and glass are measured in U values: here is an explanation and some examples. Blinds and curtains – these can play a useful part in insulation, and special blinds can be installed and easily adjusted through adjustment poles and even electric motors to the out of reach glass areas such as the ceiling. Thick curtains can help to retain a lot of heat in the evening. Basic sealing – simple DIY measures can be taken such as using sealing strips for windows and draught excluders to help prevent heat escaping under the outside door. How much heating and insulation will you go for? It largely depends on how much you’d like to use your conservatory. If you’re having a new one built and are keen to use it all year round, then clearly the maximum heating option – perhaps underfloor – combined with the best in insulation such as advanced glass such as Solarlux would be the way to go. Alternatively, occasional or more ‘fair weather’ use could see a less involved solution such as portable heating used. 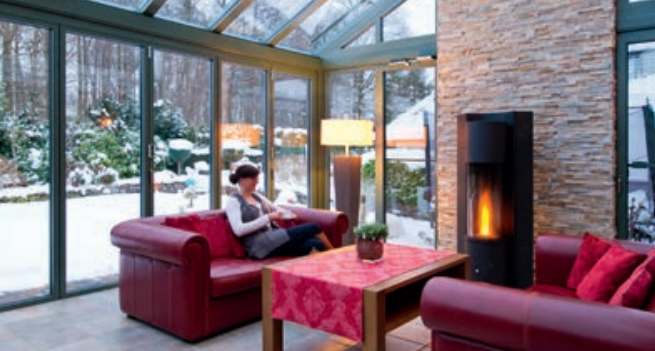 Of course, if you have a modern Wintergarden conservatory, you will stay cosy and warm all year round without a problem.